The holidays are such a busy time around our studio that I always end up dashing out at the last minute to buy gifts, as the occasion arises. I haven’t even sent my holiday cards yet, and so they will probably end up becoming a New Year’s greeting by default. By the third week of December, I’m already so over Christmas anyway, and happily at work on my Valentine’s Day and Spring collections, so a New Year’s card makes perfect sense to me. 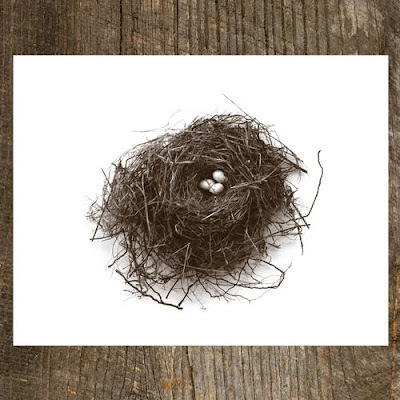 Our Earth colored duotone Nest & Eggs cards will be a perfect way to greet 2010, and the set of 8 blank note cards tied with a satin ribbon also makes a wonderful last minute hostess gift. Speaking of hostess gifts, we've had a full calendar this season, so I came up with a chic and easy gift idea that would be appropriate for any type of holiday gathering. I filled mini Kraft shopping totes with a bunch of goodies, including a packet of our Handmade On Peconic Bay cards, some yummy Li-Lac Chocolates and a decorative but not necessarily holiday themed ornament from Anthropologie, and topped it all off with some brown tissue and an iridescent peacock colored ribbon bow. We celebrate Hanukkah as well as Christmas, and fortunately for us it’s a very forgiving holiday. My husband Matt and I love the fact that we have 8 days and nights to find last minute gifts for each other, and we shop right up until the 8th day, which happens to be today! Matt is always happy with the gift of chocolate, and Li-Lac specializes in cute holiday themed items. Golden chocolate coins are a tradition in our house, but this year my favorite choco-gifts were Li-Lac's dark chocolate Christmas Moose and Hanukkah themed chocolate pops tied with blue and white raffia. Handmade On Peconic Bay Nest & Egg note cards, $18 for a set of 8 at Supermarket and Etsy. The holiday season is in full swing, so it’s a good time to take a step back from the shopping madness and whirlwind of social events crammed into a few short weeks, and contemplate the universe for just a moment. But that’s literally impossible to do in New York City, where the grid is brightly lit 24/7, canceling out any perspective of the actual night sky. I do love a crisp starry night, and just once I’d like to spend the holidays in a true winter wonderland, dashing through the snow and taking lovely after dinner strolls along Main Street, gazing up at the stars. I’ve always been fascinated by the night sky, so naturally stars are a favorite motif of mine, ever since I first saw this particular star illustration (top), by my first artist crush Peter Max. 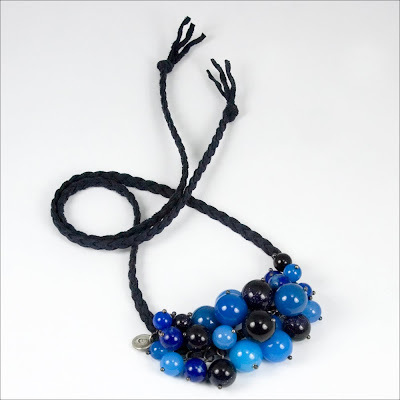 Not long ago, I found these ultra-pure blue lapis star shaped beads (above), and it was love at first sight! 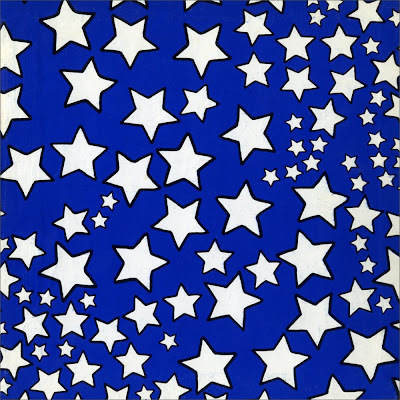 Not only did they remind me of my favorite Peter Max illustration, but the phrase “blue is celestial” just popped into my mind and I pictured a cascade of falling blue lapis stars jewels. Stars are also favored by Kelsey Merritt, who incidentally IS a rising star in the pop music biz. Kelsey and the Chaos! has been ripping through stages and exciting fans all over the country, so be sure to preview their smoking hot new single “Life Goes On”, and buy it on iTunes December 15th, when you’ll also get Kelsey’s very cool cover of “Santa Baby” free with your purchase. Kelsey was a guest model for my Blue Is Collection, and here she is wearing her own star patterned top with my Blue Is Celestial lapis star earrings and necklace. Can one wear too many stars? I think not. 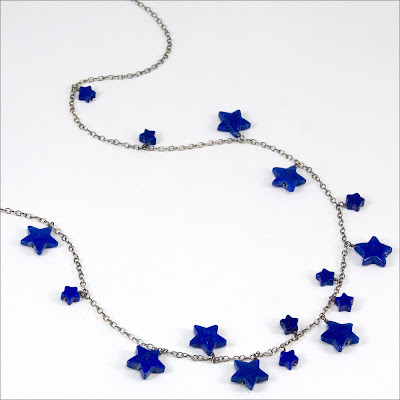 Cynthia Rybakoff Blue Is Celestial oxidized silver and lapis star earrings, $78 and necklace, $110 at Supermarket and Shopflick. 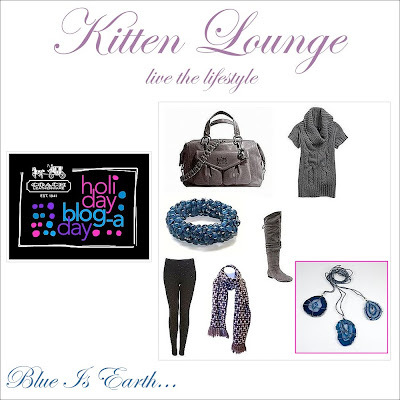 Check out my Blue Is Earth pendants in this special holiday feature slash Coach handbag give away on Kitten Lounge today. 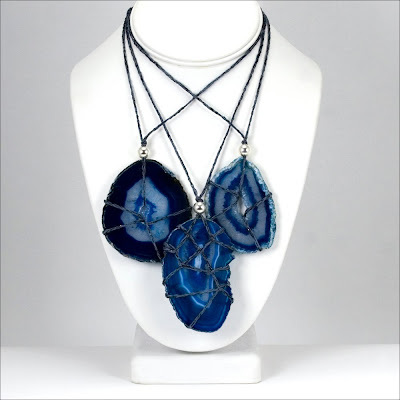 There are only three of these one of a kind hand crocheted blue agate slice pendants, and they are available exclusively at Supermarket! 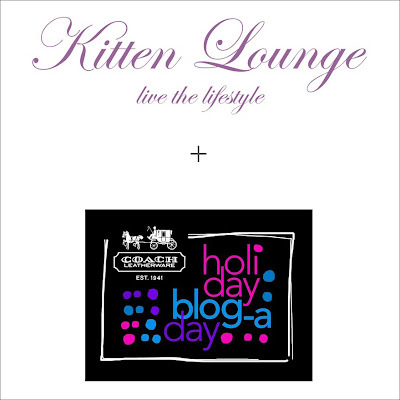 Kitten Lounge is one of 30 lifestyle blogs selected to team up with Coach for their Holiday Blog-A-Day online event. Kimmie Smith styled my pendants with this fabulous Coach Audrey bag, which Kitten Lounge is giving away on December 24th. J'adore the indie-urban grey and blue color story, and have already made a mental note of items from my own closet that would rock this look: long grey top and leggings, check; grey suede boots and leather bag, check; blue and silver jewels, absolutely! 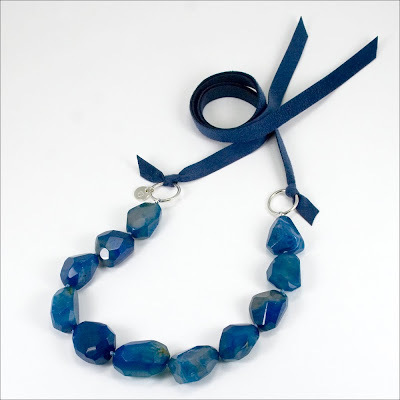 Cynthia Rybakoff Blue Is Earth sterling silver and blue agate pendants, $128 on Supermarket. One can't hope for a white Christmas in NYC these days. Maybe some holiday sleet or soggy gray ice. You can always count on copious amounts of rock salt to be sprinkled over the sidewalks if that happens, which is about as white as it gets. 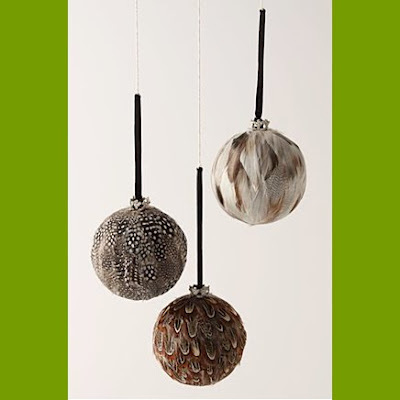 But, you can always create a festive holiday mood indoors. Some evergreen garlands and red berry branches in a vase make for a great low key forest recreation. Maybe some twinkle lights around the windows and a glass bowl of vintage ornaments on the table to complete your holiday theme. Matt and I live/work in our conjoined "studios", and the apartment is just crammed with our stuff. There's not much room for elegant holiday tablescapes, so I prefer to watch them on TV. However, I'm currently collecting white ornaments, which work nicely with Matt's beloved white fiber optic techno-tree. I'm obsessed with white decor in general, and have amassed an eclectic array of ceramic and glass objets blancs, including a cute Jonathan Adler ceramic owl, some fabulous Tiffany art glass and a series of white terra cotta Japanese inspired table top pieces I designed for a restaurant in the 90's. So when choosing the perfect frames for a new series of Matt's Cyanotypes, some of which would grace our walls, I struck white gold when I found a guy who had just scored some Wyoming snow fence. He claimed that brutal winds and raging snowstorms had weathered the wood in 10 years as much a barn that stood for 100 years in a gentler clime. 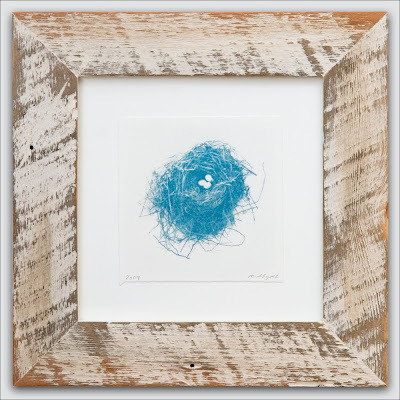 Handmade on Peconic Bay is a green design studio, and the wood we use is reclaimed and upcycled by skilled artisans into our vintage inspired frames. The lick of white paint over the surface of the snow fence is new, allowing the wood to retain it's weather-beaten surface, and giving these frames a rustic wintery look. 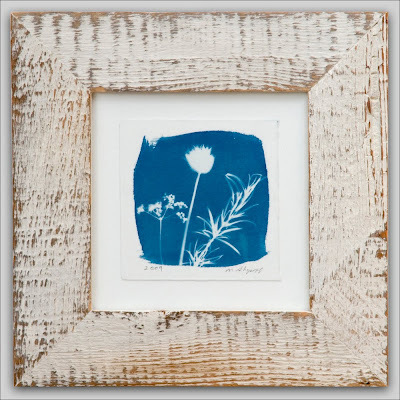 Handmade On Peconic Bay whitewash framed Cyanotype prints by Matt Shapoff, $125 - $145 at Supermarket. Today kicks off my spectacular 12 Days of Christmas savings event. First up, there’s free shipping on my sterling silver and semi-precious stone jewelry gift items under $50, to any world wide destination. 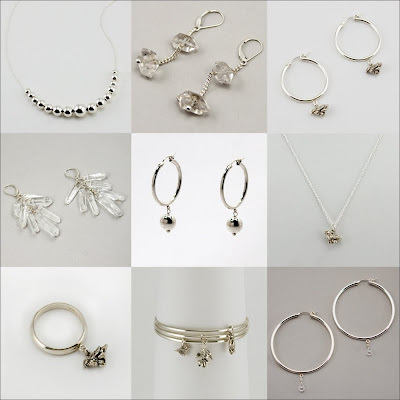 Then save 30% on select sterling silver and stone items. To top it off, I’m sending along a free Peace On Earth blank greeting card in Soil with any purchase. And it’s happening only at Supermarket through December 17th. Also, check me out in the Holiday Guide on Kitten Lounge! 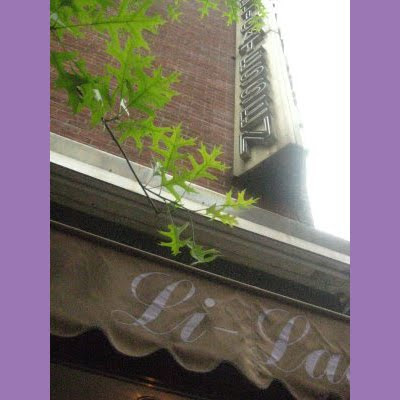 The Kitten Lounge is a fabulous lifestyle blog that brings the best in entertainment, fashion, beauty and style together. Kitten Lounge happens to be one of only 30 blogs selected to team up with Coach for the Holiday Blog-A-Day online event, and will feature my jewelry styled with Coach handbags on December 9th, when they will be the lucky blog of the day! This holiday season, I’m channeling the color blue in different shapes and shades, and searching for meaning. Some get the holidays blues for sure, but blue also has incredibly positive color energy. 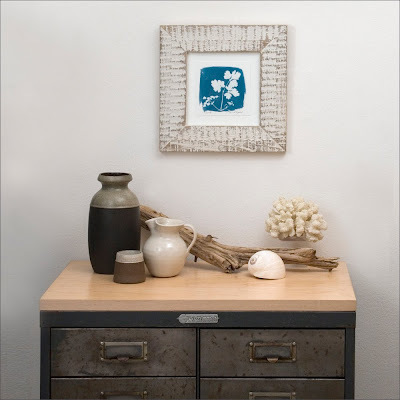 For your home, blue is a soothing sea breeze or breath of fresh air. 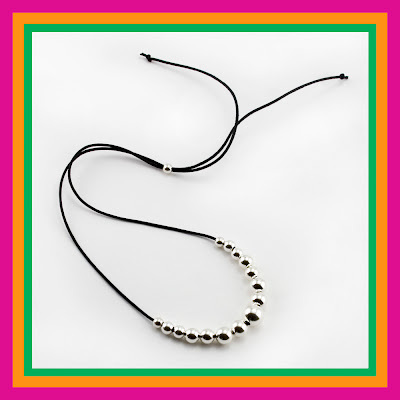 For wearing, it’s a calming and confident color. For giving, it’s universal. Blue is simply heaven sent. Inspired by the sky, oceans, and the earth as seen from space, my Blue Is Holiday collection of sterling silver and semi-precious stone jewels, is a meditation on the powerful evocations and emotions of this globally favored color, which in many different cultures represents strength, trust, and serenity. My blue musings this holiday season were also inspired by the tiny illustrated book by Peter Max with the words of Swami Sivananda, simply called “Peace”, published in 1970. 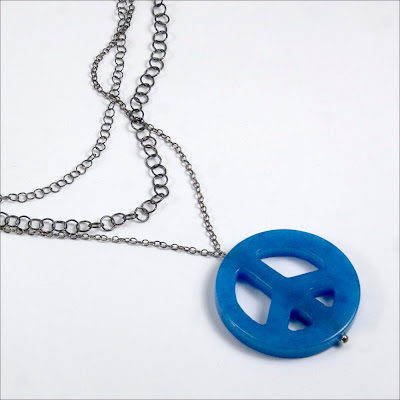 Substituting the word “blue” for “peace”, I created a series of designs that represent the many meanings of the color blue. Cynthia Rybakoff sterling silver and semi-precious stone Blue Is Holiday collection, $58 to $225 at Supermarket and Shopflick. Cynthia Rybakoff Facebook fans save 15% this holiday season in my Supermarket shop on any item, including unique holiday jewels, great gifts under $50 and my handmade holiday cards. First, if you aren't already, become a fan. Then message me when you place your Supermarket order: "Hi Cynthia, I’m a Facebook fan!". Be sure to include your full name and email address in the message, exactly as it appears on your PayPal payment and I’ll immediately refund you 15% of the purchase price, including the shipping, when I receive your order. It’s that simple! This special offer is good through December 15th. P.S Shipping is free thru December 6th on holiday cards!